In every product lifecycle process design data and product information need to be shared. Almost every department within an organisation (with the exceptions of HR and Accounting) will need to discuss the product with someone at some point along the process, whether it’s with another department or external suppliers. It used to be that engineers who designed products in CAD systems would struggle to share the CAD data with those in other departments, as specialist training and software systems would often be needed, which could be expensive, but the ability to share 3D product data with non CAD users both internally and externally is important because it reduces ambiguity and therefore aids communication. Most of us are familiar with receiving documents in a PDF format, such as phone bills, tickets and brochures, and then viewing them in Adobe Reader, which is installed on pretty much every device as standard. So why not find a way to send the CAD data in a similar format that is as easily accessible? Theorem Solutions have developed Publish 3D, a software application that allows 3D CAD data to be embedded into a PDF document, alongside any associated metadata, creating a 3D PDF. By creating a 3D PDF document, Design engineers can pass on CAD data to anyone who has access to Adobe Reader, and they can in turn mark-up, interrogate and annotate the 3D CAD data as they wish to and then pass it back to the designer for consideration. Using Publish 3D to create a 3D PDF benefits the design process by allowing a more thorough understanding of the 3D technical content of the product by staff who do not have CAD access. By using your design data to create engineering change request and engineering change notice documents to share with all of your engineering colleagues will speed up the overall process. Any additional information can also be attached to the 3D PDF document (such as spreadsheets, hyperlinks, AVI’s etc.). You can then use the 3D image embedded in the document and any additional data when showcasing design concepts so that a full overview of the product can be seen, not just the visual element of it . This can then be shared throughout the organisation, especially with the engineering department, and the supply chain. The IP of the native CAD data is also protected in the 3D PDF format but data can still be exchanged. Passwords can be set on the documents so that only certain people of your choosing can access the data. Product designers have a close working relationship with other engineers as they create the initial design concept/brief which would then be shared with engineering colleagues who need to review and asses the design and provide their own input and feedback. Using 3D PDF makes this quick and easy and so speeds up the whole design cycle. 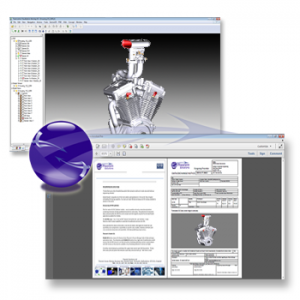 3D PDF is a great way of leveraging CAD and PLM assets. Now that the CAD data has been produced by engineers, the 3D PDF is a simple and cost effective way of sharing that data with others. What’s great about this new technology is how easy it is to use, and how it breaks down the barriers within the product lifecycle process to integrate departments, customers and suppliers. With everyone in the organisation and supply chain contributing to the design process it gives a strategic advantage in an increasingly competitive market and leads to reduced lead times, fewer mistakes and better products. This entry was posted on Wednesday, September 23rd, 2015 at 8:33 am. You can follow any responses to this entry through the RSS 2.0 feed. You can leave a response, or trackback from your own site.